Most of us who watch television tend to roll our eyes at the absurd depictions of doctors and diseases. Sadly, our patients do not, generating big ratings for shows like Fox's “House,” NBC's “ER,” and ABC's “Grey's Anatomy.” But when viewers come to our offices asking for the new treatment that reverses Alzheimer disease, or are fully convinced they have a brain tumor, it's up to us to debunk myths shaped by national TV. So I had my doubts when I first heard about “3 LBS.,” a new CBS series so dubbed for the weight of the brain. We've all seen how the media can mislead when it comes to medical themes. And the CNS, both mysterious and misunderstood, is a particularly easy target for creative license. Across the networks, patients wake up from coma, jump out of bed, and blithely ask “what's for lunch?” This may constitute good drama, but is it any wonder that housewives get desperate when after eight years, a husband tries to stop life support? Or that a radio show host can so arrogantly accuse an actor with (real) Parkinson disease of having stopped his meds? Is it the least bit surprising that a profession once so respected has become increasingly marred by suspicion and disdain? “When I see doctors on television doing things that are unethical, I am disgusted,” said “3 LBS.” Chief Medical Consultant, James M. Schumacher, MD. “On one show, a patient was intentionally caused by his doctor to worsen, on another, a physician concealed vital information, and for all appearances, it seems customary and usual for attending physicians to sleep with residents”. “These behaviors are unacceptable and make doctors look bad,” said the Yale fellowship trained functional neurosurgeon. So over two years ago, when he learned there would be to a show about neuroscience, he saw his chance to make a difference. Soon, he and Peter Ocko, the show's executive producer, were sending scripts back and forth and hammering out plots. As a practicing neurosurgeon he is well aware of the challenges that doctors face. “We keep coming up with new treatments and better technology, but in return, we are being paid less and have more medical malpractice risks,” he explained. The viewing of the pilot episode, “Lost for Words”, was followed by questions for the cast members and executive co-producer. “I want only hard questions about neuroscience,” began lead actor Mark Feuerstein (formerly of the 2002–2004 television series, “Good Morning, Miami”) who plays the touchy-feely Dr. Jonathan Seger. “It's rare that you get a script on your desk that is really about something…it's not just about people and their egos and neuroses, it's actually about the brain and I found it fascinating,” said Feuerstein, who clearly enjoys his onscreen persona. Feuerstein prepared for his role by observing neurosurgeon Ted Schwartz, MD, excising a brain tumor. “We were just chatting, and he's asking me questions about sports, and high school (we went to the same high school), and our coaches, and he's literally in the center of this person's brain…cutting out a tumor,” said Feuerstein. “And then as I'm watching him standing over a hole in this person's head, in the middle of the brain, he explains that if he is one millimeter off, the patient loses his language, or if he's one millimeter deep, he loses memory…it was just the most amazing experience for me,” he reflected. Because Dr. Schumacher leaves his practice only twice a month to consult on the technically-intensive scenes, there are niggling details that sneak through to production – Dr. Hanson, without surgical mask or cap, scrubbing his hands before surgery; an MRI machine saleswoman demonstrating her new scanner while seated at its side wearing magnet-attracting gold jewelry. And a violin prodigy with a “tricky little astrocytoma” undergoes a temporal lobe resection in a sitting position. She was posed upright, explained Dr. Schumacher, so that she could develop an embolus from air in her central line. In the pivotal scene, the anesthesiologist alerts Dr. Hanson that he is “sucking air.” The patient is placed in Trendelenburg, bradys down, goes into V-fib, and has a cardiac arrest requiring resuscitation. In the next scene, Drs. Seger and Hanson, walking in slow motion to the sounds of orchestral jubilation, burst through OR doors, and rip off their masks. The only things missing were the capital N's on their scrub-clad chests. Although the entrance was intended to broadcast surgical triumph, the Columbia audience responded with howls of laughter. “There hasn't been a show like this since Ben Casey,” said Dr. Schumacher, who revealed that his career aspiration took seed in 1965 as he watched Dr. Irving Cooper perform a pallidotomy on television. Dr. Schumacher wants his scenes to be just as realistic and would like neurologists to know that he'll make sure that future shows will be based on solid neurology. Upcoming story lines focusing on neurology will include a patient with temporal lobe epilepsy who sees God, a patient with synkinesis, and another with prosopagnosia. While it worked for Oliver Sacks, the question remains as to whether it will work on TV. I, for one, want to see more. 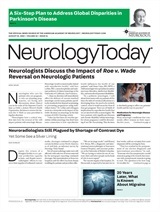 Neurology Today6(23):30-31, December 5, 2006. For Your Patients-Stroke Guidelines: AHA/ASA Temporarily Removes Sections of Stroke Guidelines for Additional Review: What Comes Next?